Anime refers to Japanese cartoons and covers a wide range of genres and demographics. There are anime movies and TV shows for kids and adults. You can find sci-fi, romance, comedy, fantasy, and other popular genres of anime. In Western countries, the programs are either subtitled or dubbed with English voice actors. 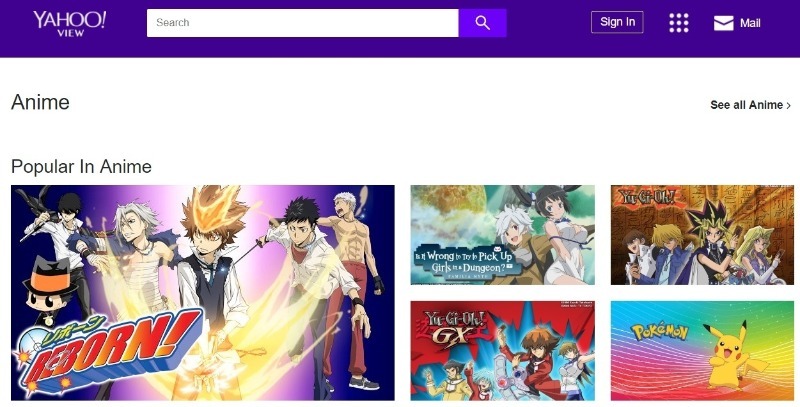 As anime becomes more popular, people are searching for places to stream these movies and TV shows. While there are many sites that host pirated anime, there are also many legal sites. Crunchyroll is the largest streaming site dedicated to anime. You can also watch the available programs through the Crunchyroll app on mobile devices and most streaming devices. 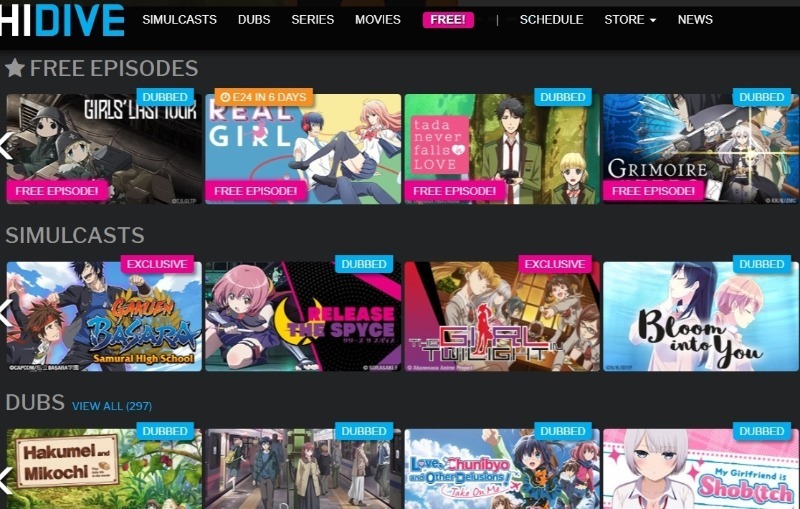 There are hundreds of anime movies and TV shows available for free with ads. The site also hosts thousands of manga titles, which are the Japanese comics that many of the anime programs are based on. 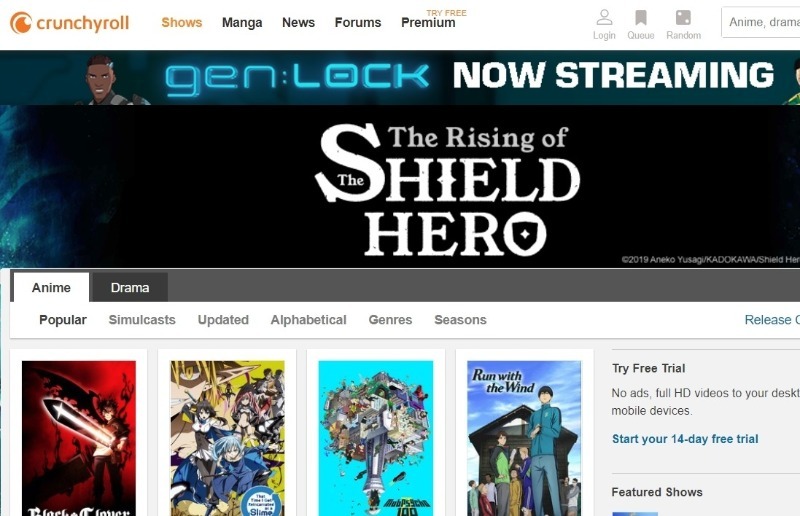 While the anime is available for free, Crunchyroll also offers a premium membership that allows ad-free streaming and access to anime simulcasts. A simulcast means that new episodes of a series are available immediately after the Japanese broadcast. Funimation is a major distributor of anime and responsible for bringing hundreds of dubbed anime titles to the English-language audience. Many of the anime titles available on other streaming services such as Hulu or Crackle are distributed by Funimation. Funimation now has their own streaming service, giving users access to the entire Funimation library of anime TV shows and movies. 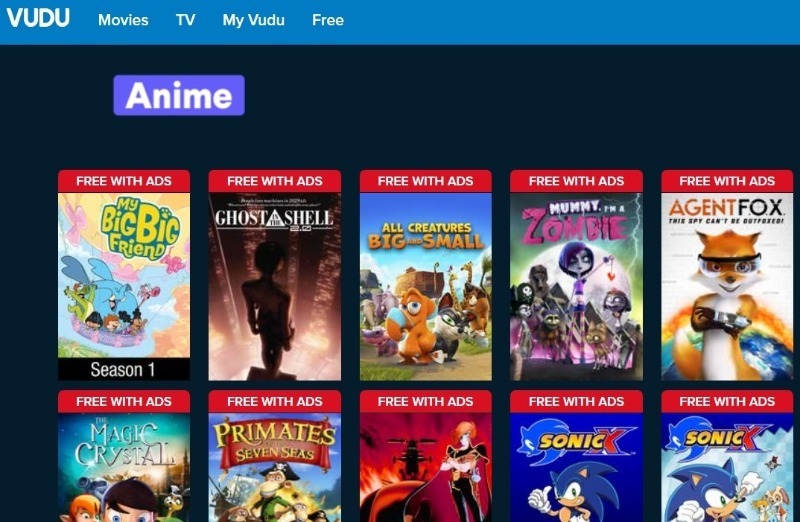 Funimation charges a small monthly fee for users to enjoy ad-free streaming of hundreds of titles on any device. The subscription also includes access to a growing list of simulcast programs that are immediately available with English dubbing. Yahoo View is the free streaming service from Yahoo and features a variety of programs including anime. Several hundred popular titles are currently available on the website. Most of the anime shows on Yahoo View are programs that were originally distributed by Funimation and are also available on Hulu. However, Yahoo View does not require a subscription. The shows are presented with commercial breaks but can be streamed for free without a sign-in. With Tubi TV, users can stream over 12,000 titles for free on almost any streaming device or web browser. The available titles include over a hundred anime TV shows and programs, which are available with limited commercial breaks and no monthly fee. The website and apps are easy to browse, presenting the titles in a simple grid layout. Each title is displayed with the cover, title, age recommendation, year of release, and genres, making it easier to browse for new shows to watch. The available programs include anime from almost every genre including comedy, action, and sci-fi. VRV is a streaming service with both free and premium options. With the free service, users can access over 20,000 hours of free content that includes hundreds of anime TV shows and movies. The content available on VRV is offered through various channels that are hosted on the platform. Several of the premium channels are dedicated to anime. These channels include Cartoon Hangover, Crunchyroll, and MONDO. VRV is available on most streaming devices, gaming systems, and web browsers. With the free version, the programs are streamed with ads. Best Dubbed Anime is a smaller streaming site with a limited selection of titles. However, the available titles are all dubbed. Most of the shows are also available in HD. The site does not require a subscription. You can visit the site and instantly start watching your favorite anime shows or discover new content. Instead of commercial breaks, the site contains a lot of pop-up ads. It is also only available through a web browser. VIZ Media has over three decades of experience bringing anime and manga to Western audiences. Similarly to Funimation, VIZ is a major distributor of English-dubbed anime. The VIZ website provides access to a selection of dubbed and subtitled anime, including many popular titles. Besides free anime, users can shop for titles. VIZ sells Blu-Rays, DVDs, and digital downloads of the anime titles that they distribute. 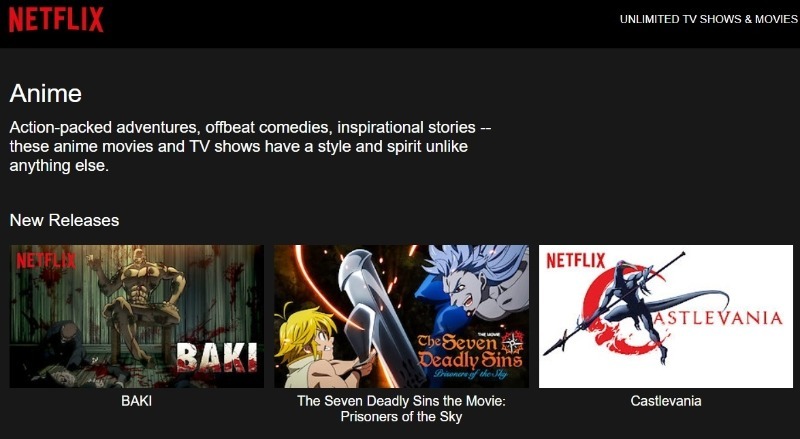 Netflix has a growing list of anime titles, including shows that are exclusive to Netflix. The streaming giant has even created some of their own anime. Netflix is a subscription-based streaming service with multiple pricing tiers. Subscribers can watch shows and movies on web browsers, mobile devices, game systems, and most streaming devices. Most titles are available in HD with English dubbing or subtitles. Crackle is a free streaming service available on most devices and web browsers. Sony owns the site, which offers a diverse selection of TV shows and movies along with a few original series. The anime selection is limited but includes English-dubbed series that are available with limited commercial interruptions. There are currently about a dozen different anime titles on Crackle. While Crackle is a free site, users can create a free account to enjoy a few extra features. After registering, users can resume where they left off and keep track of their favorite shows. HIDIVE is a subscription-based streaming service dedicated to anime programs. 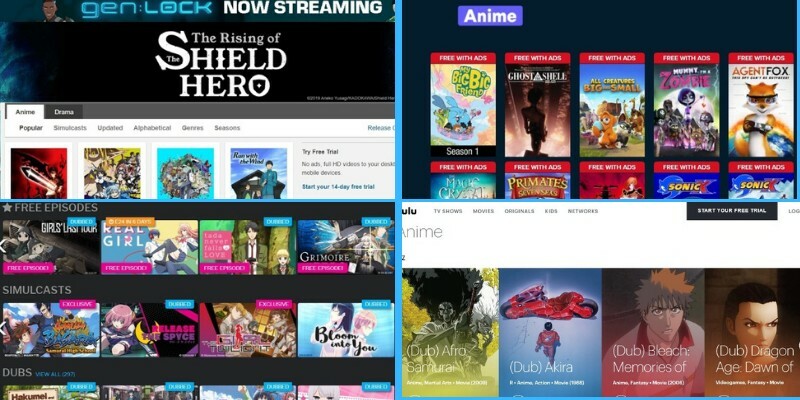 Users can access HIDIVE through web browsers, mobile apps, or streaming devices. When visiting the website, visitors can access a select number of programs for free without subscribing to the service. However, most of the free episodes are the premiere episodes of various series, requiring users to subscribe to continue the series. With the paid membership, users gain access to English-dubbed simulcasts and exclusive series that are not available on other platforms. Asian Crush is a popular streaming site focused on Asian cinema and television programs, including anime. The site currently has over 50 anime titles that are available for free. The available titles include a mixture of English-dubbed and subtitled TV shows and movies. Users can access Asian Crush through web browsers, mobile devices, and streaming devices. The titles are available for free but they are preceded by several commercials. Asian Crush also offers a premium membership, which includes uninterrupted viewing with no advertisements and premium content that is not available to the free users. Hulu is one of the largest streaming services, offering a wide selection of TV shows, movies, and video clips. 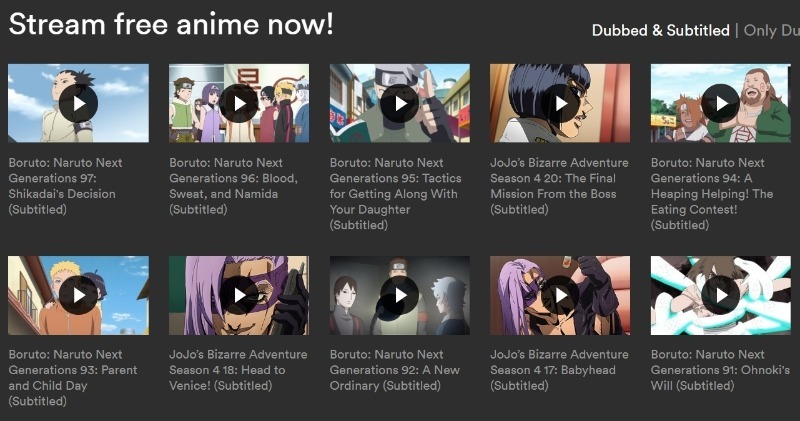 The Hulu anime section contains hundreds of titles with many popular series available with English dubbing or subtitles. While Hulu previously offered free content, the site now requires users to select a paid membership plan. The paid plans include a cheap option with limited commercial breaks. For a few extra dollars, members can enjoy commercial-free programming. Hulu offers one of the largest catalogs of English-dubbed and subtitled anime. The site even offers simulcasts of top anime TV shows. 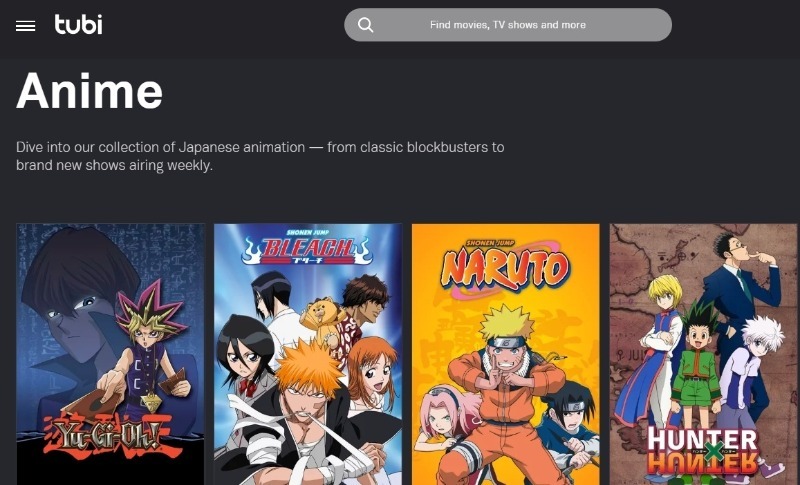 Besides watching anime through a web browser, Hulu members can download the Hulu mobile app or access Hulu through streaming devices such as Roku or Amazon Fire TV. Anime Planet was launched in 2001 as an anime and manga recommendation database. Users can create lists of their favorite shows and share their lists with other users. The site does not host its own content. The anime programs that you find on Anime Planet are available through Crunchyroll, Hulu, and Viki. 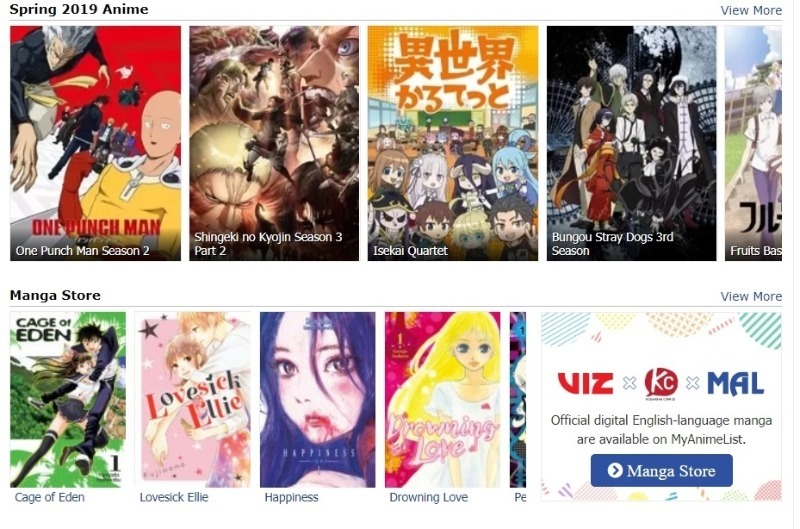 With Anime Planet, you can browse the anime titles available through these various streaming platforms, providing a convenient database for finding your favorite anime. Anime Planet also has a large online community of anime and manga fans. Discuss anime with other fans or receive recommendations based on your favorite series. VUDU is a video-on-demand service that offers access to thousands of movies and television shows. Unlike the other streaming sites, VUDU primarily operates as a rental service. Movies and TV shows can be rented and then streamed on compatible devices. However, VUDU also offers a selection of free content. The free anime on VUDU is available with limited commercial interruptions. The anime selection is not large and some of the titles are Western cartoons instead of Japanese anime. While the selection is limited, VUDU has a few titles that are not available on other free platforms. My Anime List is an online database and community dedicated to anime and manga. 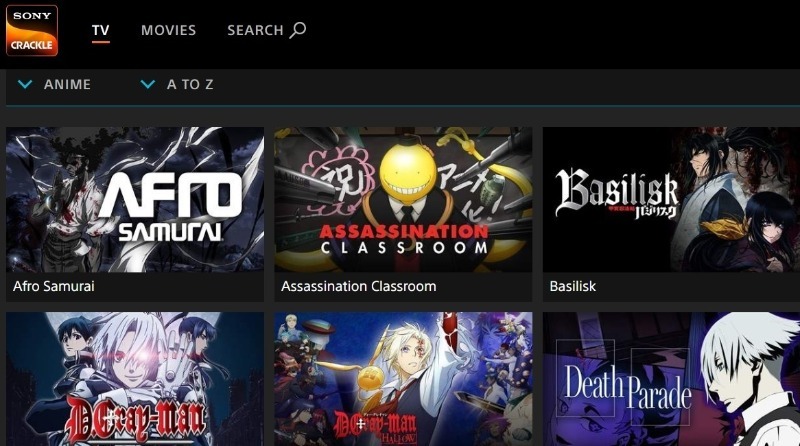 Users can browse for almost any anime title to find useful information about the series. The available details include episode lists, credits, community discussions, pictures, reviews, and news related to the anime title. Another useful feature is the user recommendations. After selecting a series, you can find the related titles that are most recommended by other users. Most episodes are not hosted on the site. When you find a title that you want to watch, you may be redirected to the streaming service hosting the anime, such as Crunchyroll. Besides anime, the site provides access to a large library of manga titles.